The exquisite four star Harts Hotel in central Nottingham is one of the many wedding venues where I have been very proud to have worked. I also enjoy an excellent working relationship with Sally Martin, who is the wedding coordinator, and all of the staff at this wonderful hotel. Harts truly enjoys the best of both worlds. Not only is it located right in the heart of Nottingham city centre, but it also boasts a magical garden terrace to the rear of the hotel. Sensational panoramic views over the exclusive Park area of the city can be enjoyed from this location, and I can always capture some spectacular group shots here. It is a fine place to enjoy your welcome drinks and savour the delicious canapés on offer. Indeed, Harts Hotel was recently awarded two prestigious prizes for its excellent cuisine and service. It has one of the most highly regarded restaurants in the entire East Midlands and your guests will be treated to a culinary treat on your big day! The stylish modern bar area and serene courtyard on the ground level of the hotel always affords me with the opportunity to capture some informal shots on wedding days. This is a great time to mingle when the guests are enjoying some pre-wedding breakfast drinks and obtain some natural organic shots for your wedding day album. This 4 star restaurant and hotel is contemporary and stylish, with a full wedding license for civil ceremonies and partnerships and has the ability to cater for up to 100 for a sit down wedding breakfast. Whether you're planning a small intimate wedding or something larger, Hart's can cater for every ocassion. 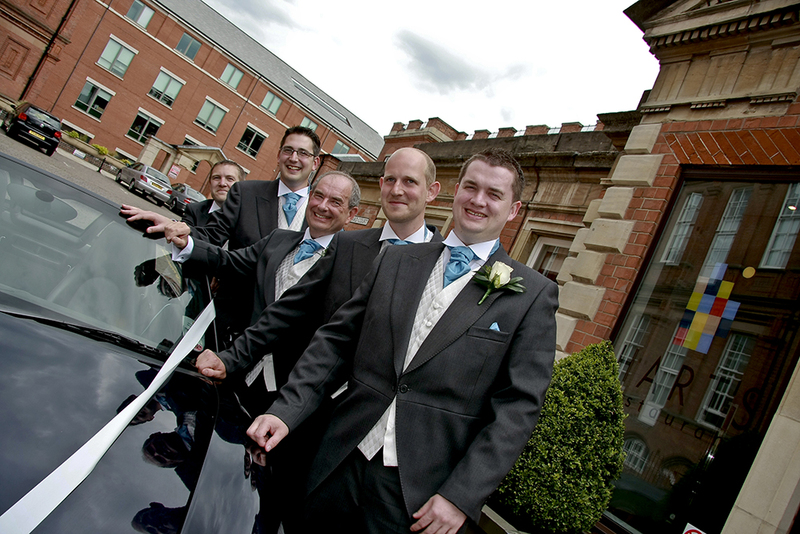 Hart's Hotel entrance provides a impressive backdrop to photograph the groom and grooms men. My studio is located close to Harts Hotel and my extensive local knowledge of the surroundings also permits me to utilise some exceptional locations for both romantic shots and group photographs. Sally Martin (Wedding coordinator) and the award winning team really know their stuff when it comes to helping couples plan their wedding or civil partnership. For more details and to speak with Sally, please contact Hart's Hotel and Restaurant. Having a good relationship with Sally and the team helps us work well together to create a seamless, stress free day for wedding couples and their guests. Indeed, I'm delighted to be included in the venue's prestigious supplier list which is a lovely testimony to the quality of my photographic work.